It was a bit of an experiment on the part of “Obit” filmmaker Vanessa Gould and her editor Kristin Bye, but when attempting to convey into the vibrancy of New York Times writer Margalit Fox’s vivid obituary for the prolific typewriter repairman Manson Whitlock as well as the rich life he lived, the duo knew this couldn’t be some solemn memorial, instead opting for a resplendent display of still photos from Whitlock’s life that appear on screen to the pounding of a keyboard as if Savion Glover were stomping the keys by foot as Fox reads her own work. As it is said early and often in “Obit,” these writers usually only devote a sentence to the death of their given subject while using the rest of their word count to celebrate their life, but Gould goes one step further in reviving the famous, infamous and simply interesting people that the Times features on a daily basis by combining the eloquence of their prose with her own investigation into who they were in rare film and still photographs that breathe new life into them on screen. Both the filmmakers and the New York Times staff make such work look effortless when surely it is not, in the case of the latter involving deep dives into a dungeon-like research center lovingly referred to as “The Morgue” where archivist Jeff Roth can find clippings from 1921 or following a circuitous trail of phone numbers in search of friends and relatives in race against the clock to make the next day’s paper. Although Gould had slightly more time to create something as enduring as the work of the people she profiles, it wasn’t easy as she and the film’s producer Caitlin Mae Burke (“Approaching the Elephant”) explained a day after the film’s premiere, en route to Hot Docs in Toronto, and the two spoke about how their own efforts mirrored that of their subjects, taking advantage of perceived limitations and looking at the lives we lead in a different way. Vanessa Gould: About five years ago, one of the subjects in my previous documentary [“Between the Folds”], who was a French artist and pretty unknown, passed away at the height of his career in the outskirts of Paris. As a filmmaker who had covered his work for several years, I was aware of the void that existed in his absence, so I contacted the biggest English newspapers around the world just trying to get him some recognition. The only newspaper that wrote back three or four days later was The New York Times and they ran a lengthy, gorgeous obituary and I just couldn’t believe that at a newspaper that you would think is only concerned with what’s going on right now, they would take time to write with painstaking detail an obituary for an unknown French artist, with a slideshow of his work. The commitment they put into it just made me really start to study the obituaries and inquire why the New York Times is committing resources to doing this with some of its greatest writers. The more I saw, I got obsessed with the idea of making a documentary about them. Did you realize in telling the story of obituary desk, you too would be bringing some of their subjects back to life? Vanessa Gould: That’s the magic of film though. Part of the reason I knew the idea to make a film about obituaries, especially The New York Times obituaries [desk] was so rock solid was because it was completely begging for documentary treatment – video, visual, and music. It look a lot of work to try and make it good, but I felt like the nugget of the idea was a strong one. I had read your editor Kristen suggested watching “The Gleaners and I” before making this. Was that or any other films an inspiration? Vanessa Gould: Kristen and I have very strong preexisting artistic and creative compasses and I think we were drawn to the Chris Marker school [of thought] – gentle, quiet, observational – even though what we made wasn’t a Chris Marker film. “Sans Soleil” will just forevermore be [a touchstone]. But I feel like we didn’t have any hard and fast influences. I actually looked to music and poetry and even painting more to make me feel alive and ready to express myself creatively. How did the structure of this come about? Vanessa Gould: We worked really hard to get a tempo that kept your emotions moving in different ways with humor, pathos and a teary moment here and there. Caitlin Mae Burke: What strikes me about seeing the finished film is that this is about investigating people’s lives and not focusing on their death because as it’s said in the film, “The death is one detail that’s in an obligatory sentence [in the obit],” but largely, it’s why do we care about these people? That was the question of the documentary: why do I have to care about this thing? What drove the film is, how do we bring these people to life? With archival footage or the words of the writers or with anecdotes telling the stories [of the deceased]. That really help buoy the film and tie some balloons on to it because it was like, what is the best way to show David Bowie young and alive? Or [in the case of] this person that you’ve never heard of, let’s find some photographs from his childhood, so you’re really looking at his whole life and stuck in this gloomy moment of a loss, [instead] really knowing what you’ve lost. Vanessa Gould: Yeah, we struggled a lot with the cliché of in memorium-type reels. We tried desperately to never let a single frame of this ever start to take on that character. We really did scrub through a lot of archival options and dig pretty deep to find pictures of even people like Elvis Presley or David Bowie where when you see it, you could connect with them in a visceral way and not be like, “Oh, there’s the [same] clip that are used in the reels [every outlet is] running of this person,” where you almost start to zone out. Whenever somebody was on the screen, we wanted them to feel incredibly alive, almost like you’re seeing them for the first time or in a new way. We didn’t want to show Michael Jackson doing the moonwalk across the screen or any of that kind of stuff that becomes so rote. That’s part and parcel of trying to make these people feel alive. Was it before or after hearing Margalit Fox’s mellifluous voice that you decided to have the writers read the obits they’ve written? Caitlin Mae Burke: Margo could read me the phone book and I’d be so curious about all the Johnsons that are there. You can see it in her writing too that she [enjoys] verbal gymnastics. Vanessa Gould: I basically read all of the obits [the writers featured in the film] had written in the weeks before interviewing them, which was probably close to 2,000 combined and I ultimately let the obituaries that the writers remembered writing dictate our course. Of all the 750 names that Bruce [Weber] has covered, which are the ones that he can actually still remember at the end of the day? Halfway through shooting, some of the writers felt more comfortable recounting the ones that they remembered in the words they had written rather than describing what they had written [since] the words they committed to paper were the best words they were ever going to come up with about these people. At that point, I was like, “Hey, let’s have [Margo and Doug] read them,” because those were the two that actually dictate their lead paragraphs, so I had each of them read about five or six of their favorite leads and that’s how we got those recitations. You mention seeking out rare footage of famous people, but you also get footage of some of the more obscure people featured, like the adventurer John Fairfax or Candy Barr, a stripper from Texas who dated Lee Harvey Oswald assassin Jack Ruby, which seems like it must’ve been even more difficult. Caitlin Mae Burke: That Candy Barr footage came from literally a basement of a house in Seattle. Caitlin Mae Burke: Kenn Rabin is a genius — he’s a consulting producer of the film and an archivist and he knows where all those basements are. He has this expansive spider web of resources, so a lot of what we found for the film is because he has been doing this forever, he knows just where to go to uncover things or who might know someone who might have an uncle who has a collection of 16 millimeter tapes. It was a Herculean effort on Ken’s part to bring in what ended up being thousands of clips [under] the directive that we don’t want to see Elvis in the way we’ve already seen him. We don’t want the Zapruder film — we need the weird Kennedy home movies. This may be a false equivalency, but since it sounds like your process was very similar to what the obit writers actually do, did that influence how you ultimately wound up wanting to tell the story? Vanessa Gould: Yeah, we were very aware of that. It’s not perfect equivalency, but it was a useful equivalency in terms of structuring and conceptualizing [the film]. We weren’t necessarily obituarizing the obituaries desk, but we were certainly studying it in the same way and ultimately reducing it to a very time-bound, or in their case, word-bound reduction that would hopefully communicate enough to give people the sense of what they do the same way that they need in 800 words or less to do the same about somebody’s life. How did the idea of building it around a single day come about? Vanessa Gould: Necessity. Filming in the newsroom, first and foremost, is not an easy thing to do to get permission to do [because it’s] a really intrusive thing to do. When writers are on deadline under the pressure that they are, I wasn’t even willing to say, “Can we come in for two weeks?” I asked for three days, and they gave us three days. We shot some B-roll on a couple other days, but we needed to work efficiently. Caitlin Mae Burke: The film is not just a survey of American and world history, but also this is a job movie. This is an exploration of a very small [group of people] that is arguably the best at what they do at a really incredible institution and I think people are attracted to process, so the timeline makes this very attractive [in how] you can follow Bruce throughout his day and not just say, “All right Bruce Weber, tell me the stories of these 20 different people,” because the way that he does his job is also interesting. You [find out] who’s dead and by 3 pm, you’re on coffee number four and you still haven’t written anything, but [all these writers] have to become these experts in such a a short amount of time, which is really a testament to the beauty of the craft and how incredible it is that they can do that. Was it also necessity to shoot the writers out of the newsroom for what you’d likely call their master interviews? You stay out of their personal lives, but you do get a glimpse of who they are through what’s in the background. Vanessa Gould: Actually, that was extremely hard but from the beginning, my gut said don’t interview these people at the New York Times [building]. They’d all look the same. The idea was to portraitize these people in the frame, whether they have books behind them or a painting, in a Errol Morris kind of way. A picture is worth a thousand words, right? 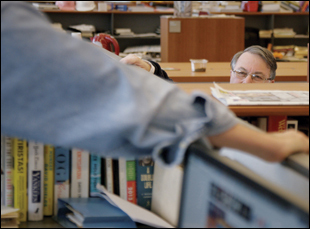 We wanted to bring these people to life and be seen as incredible individuals who happen to work at the New York Times. To start with, Bruce Weber is a really great guy and [here are] these are the clues that we can give you about him and by the way, he happens to work at the New York Times. Not everybody wanted a camera crew at their house and it took some finagling, but you couldn’t really do half and half. Vanessa Gould: After five years of working on something, it’s only natural that it was a thrill. Caitlin Mae Burke: It was so wonderful to premiere at Tribeca because this is where the story is and we were able to say, “This is the home team walking the streets,” so it was cool to be in that room with a lot of people who read the Times everyday, who get it. I also liked premiering in New York because it’s so densely populated here that everyone seems pretty dead. If you’re intensely morbid the way that I am, just knowing that we just watched 35 stories of fascinating people, [you leave thinking] I’m going to go out of of the street and look at 300 to 3,000 other ones. “Obit” opens on April 26th in New York at Lincoln Plaza Cinemas and Film Forum and in Los Angeles on May 5th at the NuArt. A full list of theaters and dates is here. Tribeca '16 Interview: Tracy Droz Tragos on Rising Above the Fray with "Abortion: Stories Women Tell"
Interview: Sam Dillon, Dree Hemingway, Keith Stanfield & Logan Sandler on the Careful Handling of "Live Cargo"